The photo of the 'Marlboro Man' in Fallujah became a symbol of PTSD from the Iraq conflict. 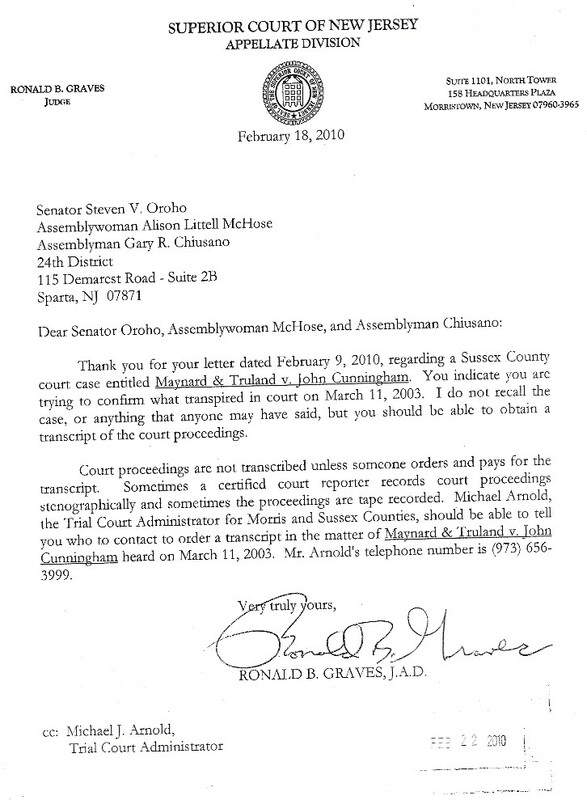 For 7 years, I wrote New Jersey judges and the NJ Supreme and Superior Court systems about a missing Superior Court transcript. The transcript had to do with legal malpractice charges being brought against a high level official of the New Jersey Supreme Court, and his former law firm. 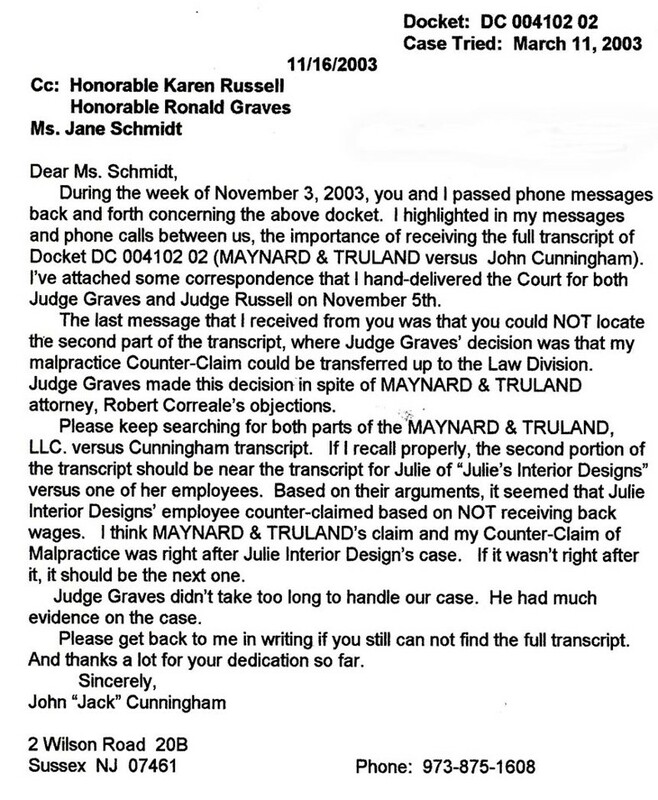 During the case, powerful and influential, Supreme Court Vice-Chairman Robert Correale (Office of Attorney Ethics) represented himself and his own law firm, Maynard & Truland. I represented myself, since no New Jersey lawyer wanted to take the case without big money up front. My legal malpractice complaints started with Robert Correale's and his law firm's gross negligence, over-charging per hour, false billing, lack of communications, coming to court unprepared and perjury. My evidence was extensive, yet simple. 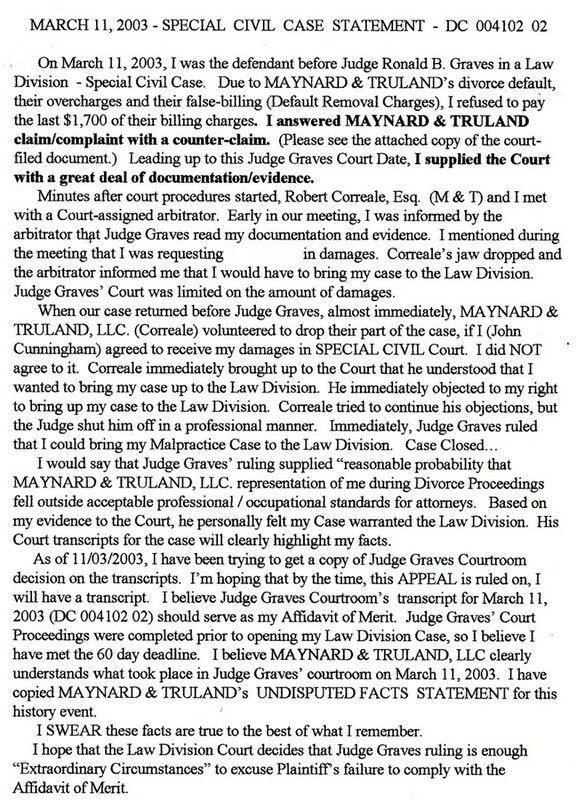 Evidence was Maynard & Truland's own contact, their own invoices, court-filed letters, court-filed documents, etc. After Honorable Superior Court Judge Ronald Graves reviewed my detailed evidence, he stated that my charges warranted the Superior Court Law Division for damages. Months later, when I brought the case to the Law Division, Judges Graves court transcript could not be used as merit, because the court clerk’s only copy of the audio transcript was mysteriously missing and could not be typed. A state Supreme Court attorney ethics official Robert Correale misuses his government and court office to Cover-Up and block ethics violations and legal malpractice charges against his own law firm, Maynard & Truland. After eight years, the Cover-Up leads all the way up to the Governor's Office, Attorney General's Office and the state's Supreme Court and Superior Court. Have you ever heard of anything so strange? There is plenty of clear and easy to understand evidence. This court transcript was going to be used by Jack Cunningham, a disabled Vietnam vetera, in a Superior Court Law Division Legal Malpractice civil case against Vice-Chairman Robert Correale, a high level New Jersey State Attorney Ethics Official. It was also going to be used in a formal New Jersey Supreme Court Attorney Ethics investigation against Robert Correale and his Law Firm, Maynard and Truland. 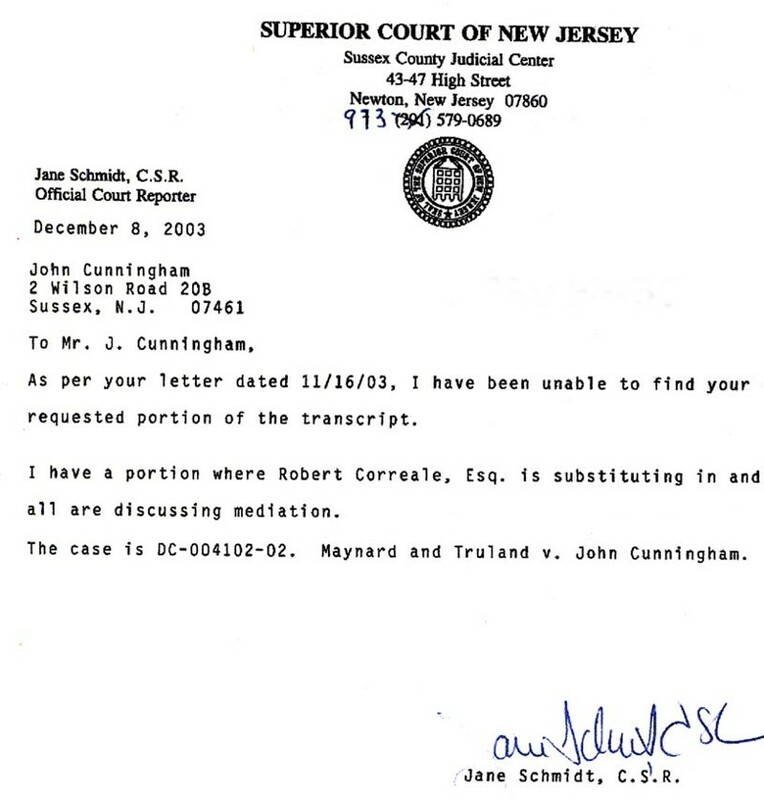 Because this evidence was lost (destroyed), both New Jersey Courts were able to throw out both of Jack Cunningham's cases and now Robert Correale,Esq. is a district attorney of Vernon Township and Andover Township, New Jersey. 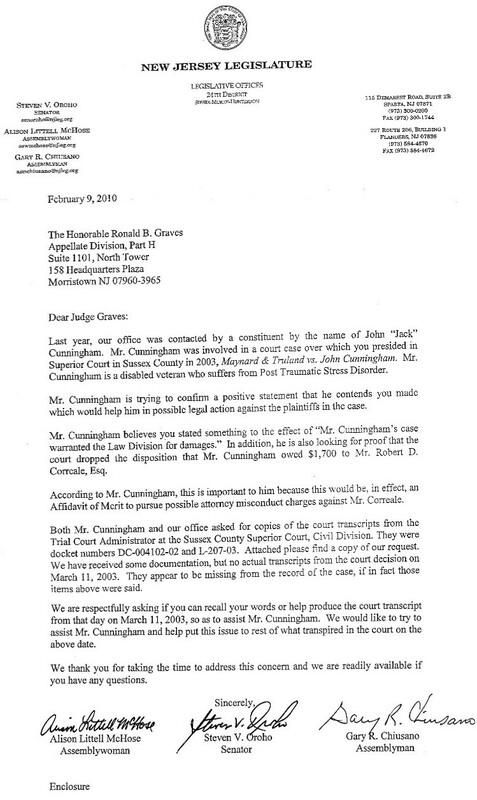 Below you will read Jack Cunningham's letters that are addressed to New Jesey Superior Court and Supreme Court judges. Numerous copies of these letters are filed in the New Jersey Court systems. 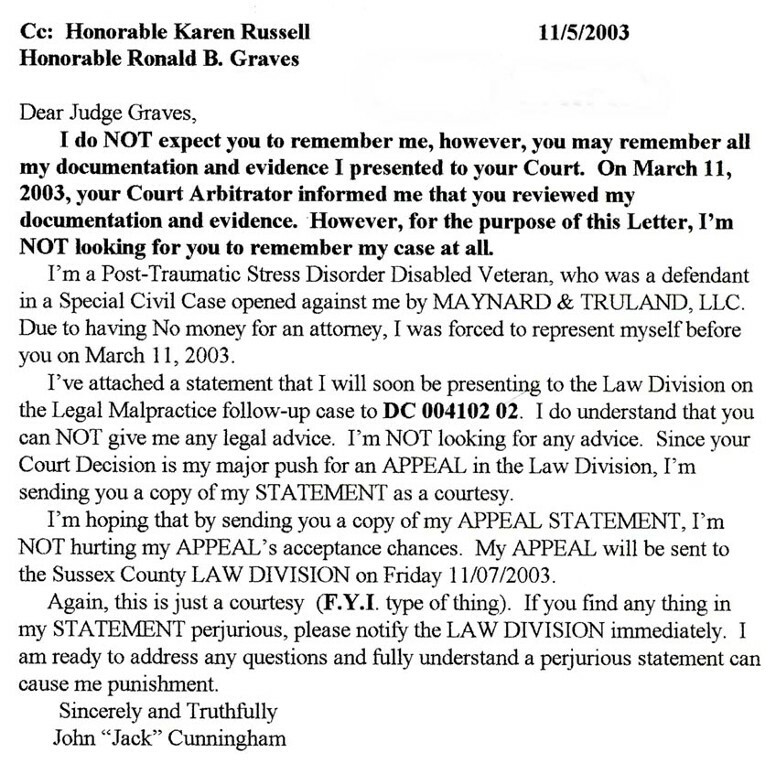 When I went to use the Superior Court Transcript of Judge Ronald Graves as added evidence in my Attorney Ethics Complaints against Maynard & Truland and New Jersey Attorney Ethics Vice-Chairman Robert Correale, the court transcript strangely went missing. The transcript went missing before it could be typed by the court's clerk. I still don't understand how that it possible. A Superior Court clerk loses just a segment of a court transcript. (You think I'm joking.) 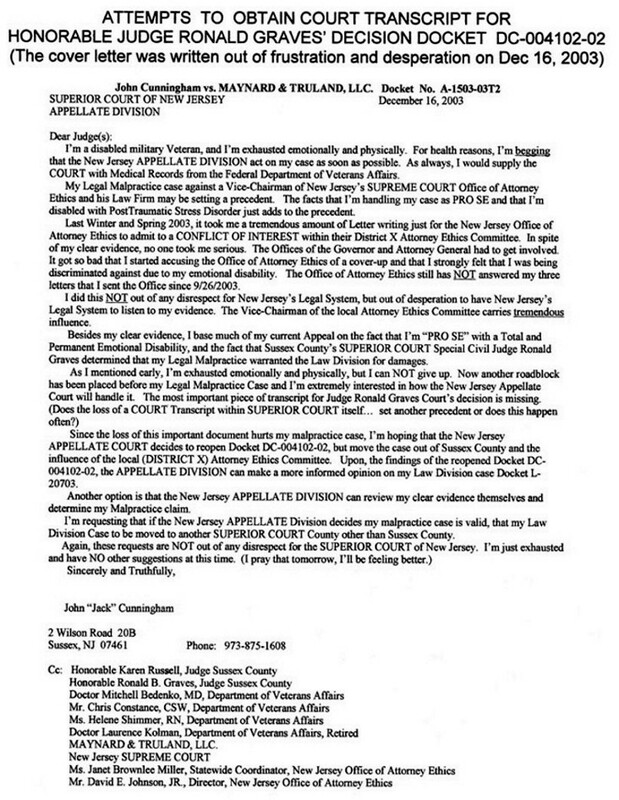 Please read the below letters that are all filed in New Jersey's Sussex County Superior Court, New Jersey's Superior Court Appellate Division in Trenton and New Jersey's SUPREME COURT Office of Attorney Ethics. Current status of the above letter. Ms. Tatiana Marquis has been in verbal communications with my wife. (Waiting for written follow up.) Assemblywoman Alison Littell-McHose, State Senator Steven Oroho and Governor Jon Corzine have not returned any communications. Please call Senator Oroho and Assemblywoman Littel-McHose and ask them, if they will be returning Jack Cunningham's letter. Please have your members of Congress call and/or write Congressman Scott Garrett and ask them to support Jack Cunningham's civil rights against the State of New Jersey.